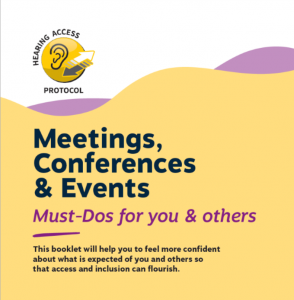 Learn more about the ‘Must-Dos’ for meetings and events in this short booklet that summarises the crucial things that everyone should know about hearing access. It sets out the Must-Dos for organisers, presenters, everyone in the room, and people with hearing loss. Workshops and video consultations are also available to support awareness and understanding. We know that sometimes the quickest and easiest way to become familiar and confident with good practice guidance is to first of all talk things over. Hearing access is essential for equality, diversity and inclusion. If you get hearing access right – you will be well on the way to creating a meeting, conference or event that everyone can participate in, whatever their hearing ability. I LOVE your new layout! Have downloaded copies for our team.